Grilling boneless skinless chicken breast is much easier than you think. There are many ways to prepare it and hundreds of ways to serve it. One of the most popular flavor combinations is lemon pepper. These flavors perfectly accentuate the taste of the chicken and make an excellent meal. This recipe is very easy to make on your indoor grill and requires just a few ingredients. 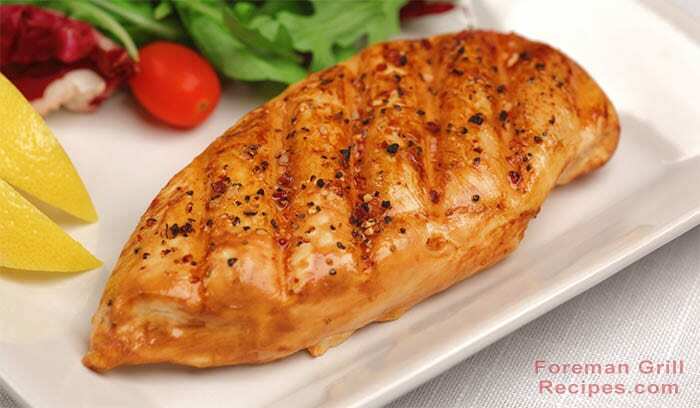 The key to most chicken breast recipes on an indoor grill to pound the meat thin – to approximately 1/2″ thick. This ensures even grilling and also helps tenderize the meat. Enjoy this recipe as a meal, chopped up in salads, on a bun for a delicious salad, or whatever other creative meal ideas you have. You can’t go wrong with this super easy recipe! Start by placing the chicken breast on a hard surface, cover with wax paper, and pound to 1/2″ thickness. This will ensure even grilling and tenderize the meat. In a plastic ziplock bag, mix olive oil, pepper, lemon zest and salt, Add chicken and let marinade overnight if possible. But if you’re in a hurry, let in marinade for at least a 1/2 hour – you’ll still get the goodness! Preheat your indoor grill for at least 5 minutes with the lid closed. Use highest setting if you have it. When grill is good and hot, add the chicken and close lid. Let cook for about 5 minutes and then check for doneness. There should not be any pink in the middle when done. You can also give the chicken a 1/4 turn halfway through cooking for crisscross grill marks. Recipe suggestion: After plating, add a couple of avocado slices and a couple of spritzes of lime juice from a fresh lime. It make an absolutely wonderful meal!